Sometimes, with the many product options on the market, there is nothing better than using the old-fashioned original. This is especially true when it comes to Swiss army knives. Swiss army knives are your best friend, wherever you are. 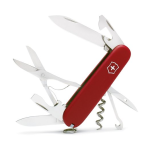 With the diversity of tools that you can find on your Swiss army knife, you can handle nearly any pesky situation. Choosing the right Swiss army knife for your needs is important, which is why the Victorinox Swiss Army Classic SD Pocket Knife is a good option. If you are looking for the classic with all the basics, then this is the product for you. 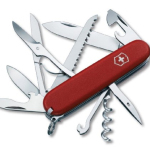 Inventor of the original Swiss Army Knife, Victorinox has been producing Swiss Army Knives since 1884. Their products are built to be reliable, diverse, and useful in everyday circumstances. Over the years, Victorinox has been creating products that have evolved with their client’s needs. However, some products are so great that they’ve remained extremely similar to the original. 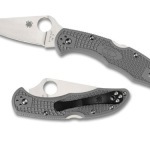 One of those products is the Swiss Army Classic SD Pocket Knife. 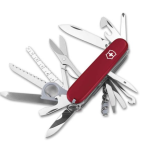 Like most of Victorinox’s products, the Swiss Army Knife is produced with the utmost quality, care, and attention to engineering and detail. When choosing a product, it is necessary to check out the product features. When it comes to the Victorinox Swiss Army Knife Classic SD, it does have some great features, those of which are listed below. The first of the six tool features that this army knife includes is the knife blade. Measuring a total of 1.5 inches, the knife blade is convenient for cutting minor items like rope, thread, plastic, and more. If the sharpness of the knife does wear down, it is possible to sharpen it with an everyday sharpener. The scissors easily maneuver and are great for cutting like all traditional scissors do. They are great for kitchen emergencies, camping trips, and everyday use. Either for yourself or for your lady, the nail file is another feature of this product. Like all of the components, it easily pops out of the knife for use. It is so much easier carrying around a Swiss army knife than your tool box. The screwdriver tip designed on top of the knife for quick access and use. Little inconveniences can be fixed with the toothpick and tweezers attached. In addition to the above tools, the product is also very durable. It is entirely made of stainless steel, which means that it will not rust and it will remain protected in rough weather. Finally, apart from the product features, durability, and ease of use, this product also comes in dozens of colors. This feature is something that also makes this product a fantastic gift or customizable to suit your own style. Therefore, not only are you getting a quality product, but you are getting one that looks great too and that can fit anywhere no matter where you go. 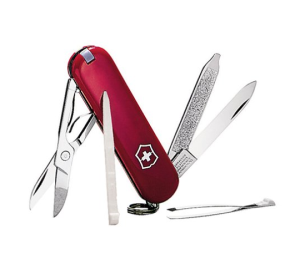 Overall, the Victorinox Swiss Army Knife Classic SD has extremely positive reviews. Users love the versatility, the range of tools, and the great quality of this product. If you’re looking for a good ole’ classic and quality item for your everyday needs, then this is the right product for you. While it doesn’t include extremely fancy gadgets, it is a product that anyone can be glad they own.